This is the third day of the One-Week Cartooning Workout created by the Center of Cartoon Studies. If you are interestedin participating in the cartooning workout, you can sign up here. Write a story that you have told verbally at least three times. It could be something funny that happened, the story of a scar, a dramatic pet story, or how you met your partner or best friend. Using only words, start writing your story the same way you would tell the story out loud. As you write, keep your pen moving for at least ten minutes without stopping. If you finish one story before ten minutes is up, start another! Whoa boy, my problem here is choosing a story to write about. Initially, there is a story I want to write about, but it doesn’t involve Wheatley or Micky at all. 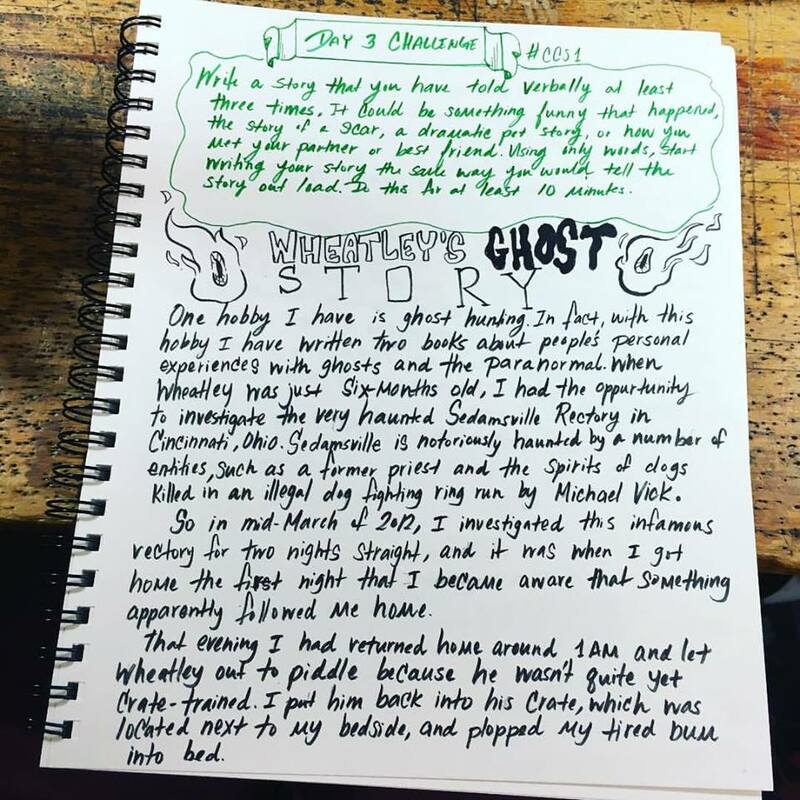 The story was about the first ghost that I witnessed when I was nine years old. 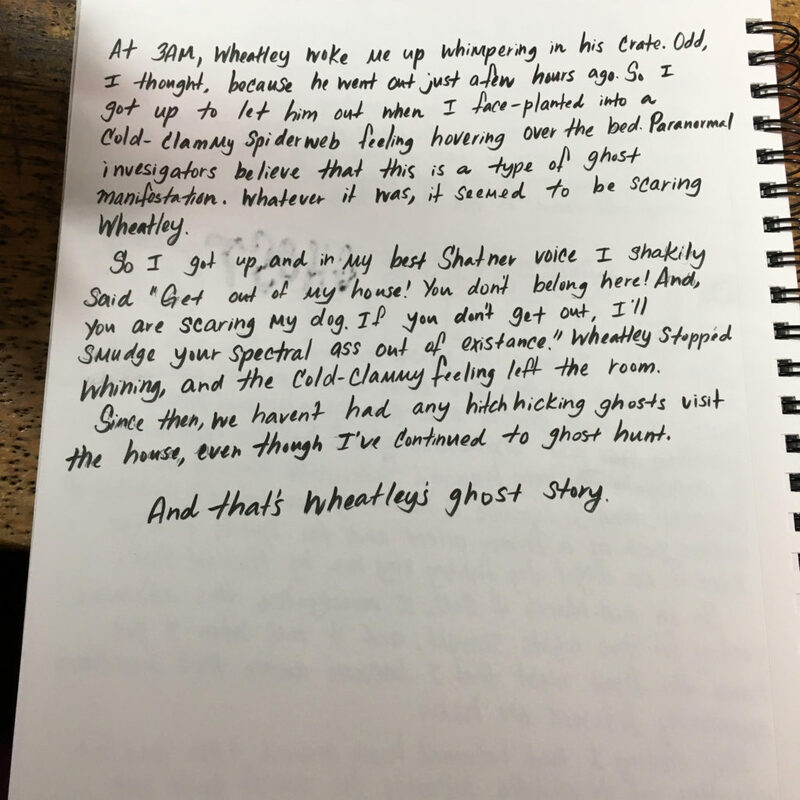 However, for the sake of consistantcy, I’ll recount the story of how Wheatley saw his first ghost. So, according to the directions, you’re supposed to write for 10 minutes straight without interruptions. You’d think that I’d be the perfect candidate for this task, but inreality, I still got interrupted. What really should have taken 10 minutes, but inreality it was more like 40. But, this is the story that I’ve told a number of times, especially on my radio show the Paranormal View. Plus, this exercise was easier to fit into one’s normal workday, as opposed to, yesterday’s exercises that took me the better part of of an evening to do. Anyway, I’m imagining that in the next few days I’ll have to illustrate the story I just wrote.